The classy Hotel Pizzalto excels in many ways and is the ideal choice for guests looking for a ski in/ ski out hotel. The impressive facilities include a wellness centre which offers many treatments and a hydromassage bath. Because the hotel is located in a quiet position by the slopes, evening entertainment revolves mainly around the hotel. Please note that during the high season arrivals are permitted on Sunday (5 and 7 nighs) and Friday (2 nights). 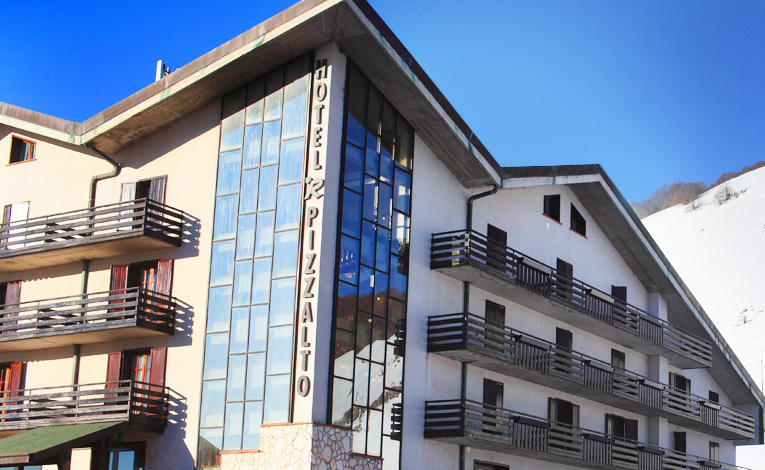 Located on the slopes with its own express quad chairlift behind the hotel, the Hotel Pizzalto combines quality with convenience. Guest rooms are comfortably furnished and each has its own balcony. The restaurant not only offers fine food and wine but also excellent friendly service, and the hotel bar is the perfect place to relax after dinner. Guest amenities include free wifi, ski storage, wellness centre and free car parking. The elegantly furnished rooms sleep from 2 to 4 people. All rooms have their own balcony, many of which look directly onto the mountain. Room facilities include TV (Italian channels), radio, minibar, telephone, and wifi internet. Bathrooms consist of bath or shower, courtesy toiletries and hairdryer. Breakfast and dinner are served in the hotel’s classic Italian dining room. The maitre d’hotel runs the restaurant with a keen eye meaning the service is both excellent and unobtrusive at the same time. Wake up to a buffet breakfast which includes freshly baked pastries and bread, cereals, yoghurt, fruit, jam, honey, fruit juices, cooked meats and cheeses. Choose from tea, coffee and hot chocolate served at your table by your waiter. Dinner is an event to be lingered over and includes three courses. An extensive salad and dessert buffet are complemented by a choice of main courses served with vegetables. A sommelier will guide you through the extensive wine list, featuring many excellent Abruzzo wines. The jewel in the crown is the Hotel Pizzalto’s own wellness centre where hotel guests can enjoy the facilities and pamper themselves with a range of treatments. A programme of optional entertainment is available for adults and children. This is mainly for the benefit of Italian speaking families, though anyone can join in if they so wish. As well as a ski deposit area, there is also a ski and snowboard rental shop at the Pizzalto. Airport transfers can be arranged on request. Each 90 minute session costs €25 and in addition there is a menu of different treatments as well as discounts for multi-sessions.